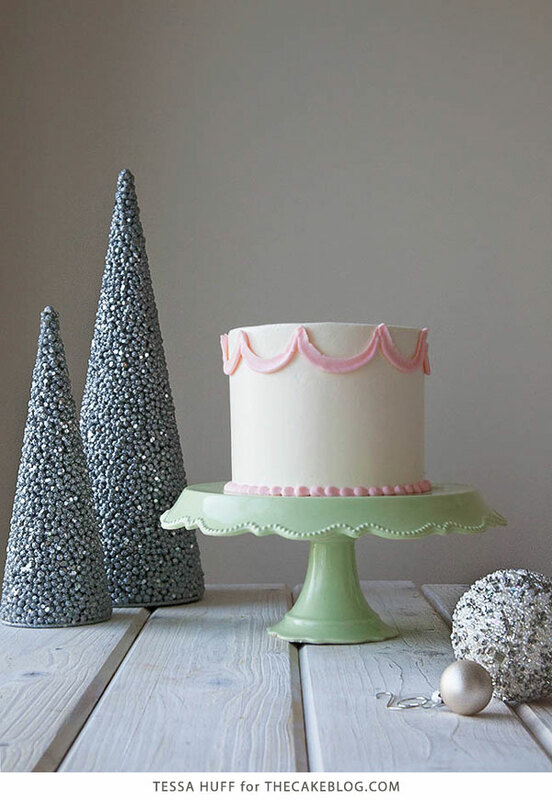 Our contributor, Tessa Huff, is back with a new cake recipe perfect for the holidays…. For most people, this time of year is all about tradition and celebration. From carol singing to cookie decorating, I bet a lot of you have holiday rituals and family customs that are practiced and passed down year after year. Personally, it’s activities like eating grandma’s cookies and sharing laughs with my cousins in our pajamas that mean the season is upon us. One good way to keep traditions alive is through food. I’m sure there is more than one reason that candy canes and fruit cake have such longevity besides just their flavors. In our house, we have the same treats and sweets each year, plus a couple new ones. Since my cooking style revolves around old classics with modern twists, I like to do the same around the holidays. This year, I sought out to reinvent a traditional molasses gingerbread cake into a new layer cake, and what a treat it turned out to be. Using classic and contemporary flavors together, I created this 6-Layer Gingerbread Latte Toffee Crunch Cake. Inspired by traditional holidays flavors and the ever-so popular coffee drinks that keep popping up this time of year, this sky-high layer cake is certainly something to celebrate. 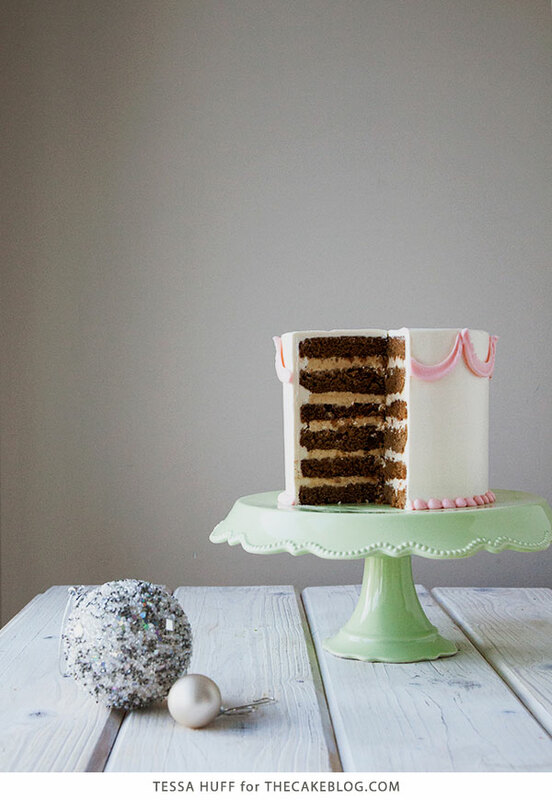 Six layers of gingerbread cake are stacked with espresso buttercream and bits of toffee. It is iced with vanilla buttercream to round off the flavorful filling. Serve at your next holiday gathering or with a bright cup of coffee. Preheat oven to 350 degrees. Butter and flour three 6 inch pans and set aside. Sift together flour, ginger, cinnamon, salt, baking powder and baking soda. Set aside. Place butter in the bowl of an electric mixer and beat on medium-high for 3-5 minutes. Add in the brown sugar and mix together on medium speed. On medium-low, add in the eggs one at a time followed by the molasses. Mix until incorporated. Add in the grated ginger. Alternating between dry and wet, add in the flour mixture and milk in 3 additions on low speed. Once mixed, divide the batter evenly between the three pans. Bake 20-22 minutes, or until done. Cool on a wire rack before de-panning. 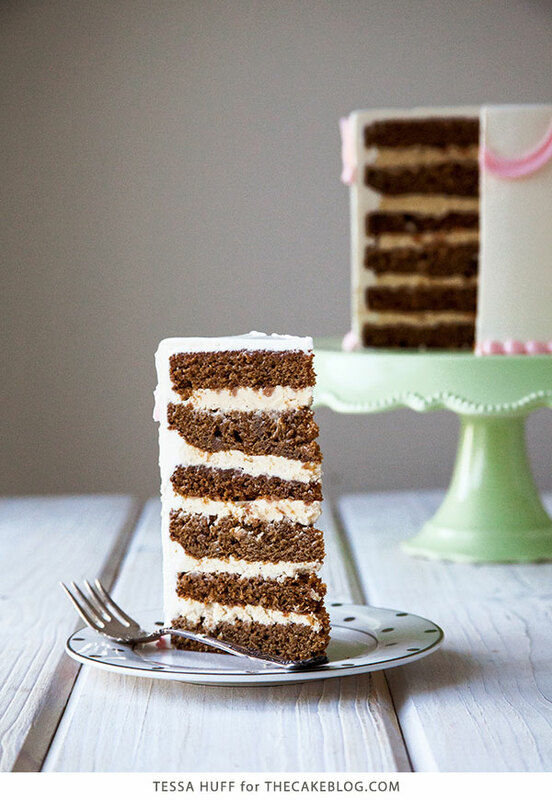 Once completely cool, carefully slice each cake in half to create 6 layers. Place the egg whites and sugar in the bowl of an electric mixer. Whisk together slightly. Create a double boiler by placing the mixing bowl on top of a medium saucepan of water. Heat on medium-high. While whisking, heat the egg white mixture until 160 degrees on a candy thermometer. Once hot, transfer the mixing bowl back to the electric mixer. With the whisk attachment, mix on high for about 8-10 minutes, or until the bowl of the mixer returns to room temperature. Stop the mixer and swap out the whisk for the paddle attachment. With the mixer of medium speed, add in the butter, a few tablespoons at a time. Add in the vanilla and continue to mix until smooth. Meanwhile, dissolve the espresso powder into the hot water. Once the buttercream is done mixing, divide in half. Reserve half for icing the cake. Mix in the expresso into the second half of the buttercream. Feel free to make the espresso flavor stronger by dissolving more powder into the 2 ounces of water. 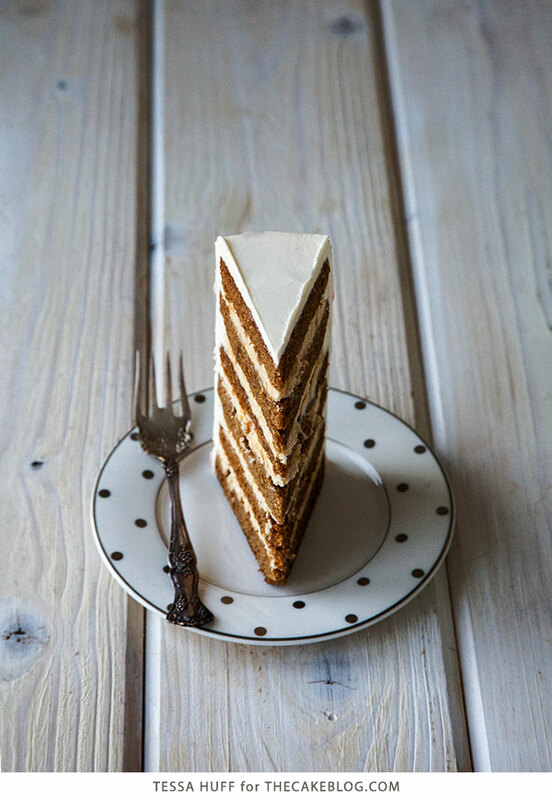 Layer the gingerbread cake with a thin layer of espresso buttercream. On every other layer, sprinkle with bits of toffee. Ice the cake with the remaining half of the vanilla buttercream. 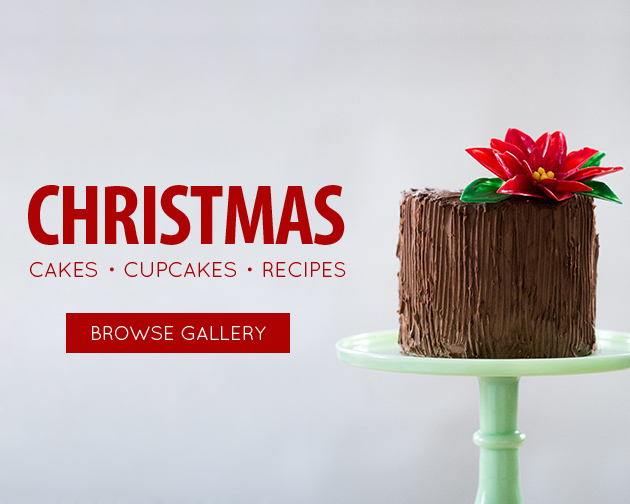 Find all of our holiday recipes and tutorials in our Christmas Gallery! 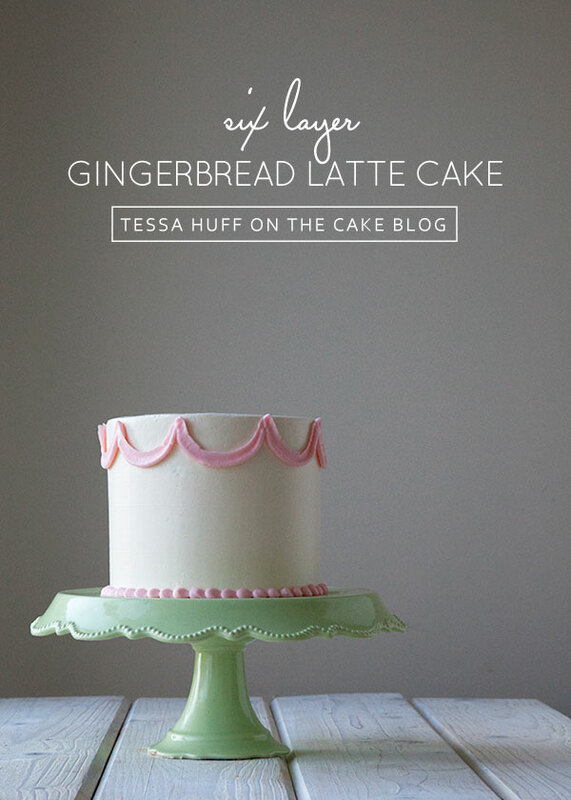 Tessa Huff is a professional cake designer and lover of all things art and design. She particularly enjoys creating edible decorations, sugar flowers, and unique flavor pairings with fresh, seasonal flavors. Read more about Tessa on her bio page. Looks fantastic. Could I make this into cupcakes? Is go, how long would I need to bake them for. Looks so amazing and what wonderful flavors! Can’t wait to try it! This looks beautiful! 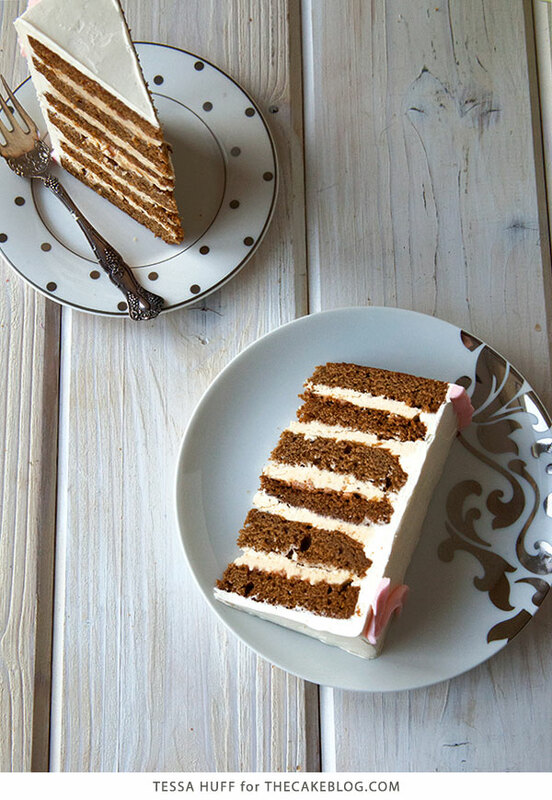 I love elegant, simplistic cakes, and this one looks scrumptious. I love how tall you made it! I’m curious though, what kind of frosting did you use to ice the outside of the cake? The inside is the espresso buttercream, but the outside is a bright white. It is just plain buttercream? Good question Sara! In step #9, Tessa divides the buttercream in half. Reserving one half for the outside frosting. The other half is then used for the espresso buttercream filling. What a beautiful cake. I love the gingerbread cake idea too. This is really a wonderful alternative to the regular rich fruitcake – and I am considering trying to make this…not sure if I will have such wonderful success as this talented and clever lady has…but thanks for sharing the recipe, Tessa. I think I will aim for just a 3 layer cake – not confident at making your 6 layer one. Be interesting to see if my tried and true fruit cake will be retiring once your recipe has been tasted. I used this recipe to make cake pops. It was delicious! Could you make this cake in two eight inch pans? Tessa, this is a wonderful recipe and so easy to make. It’s a keeper at my house. Thank you for sharing this! I would love to make this but what would the weight conversions for the items listed be in the UK? There are cup-to-gram conversions on dish.allrecipies.com for different ingredients and, for cup to ml, search cup to ml on google and it gives you a calculator. Light or dark brown sugar? And what type of milk? I know different fat contents yield very different results. Not even close to done after 22 minutes baking for me. How long is it taking for others? It took an hour cooking time. Pretty huge time difference. What’s cake tins do you use?